Master chefs train for years to up their cooking game and bring it to a level that we mortals just can’t match. Despite that training advantage, they do have a secret weapon that ordinary home cooks can borrow to bump up their cooking with just a simple ingredient swap. Keep reading to find out why you should trade your old table salt for gourmet sea salt to take your own favorite dish to the next level. So what makes these fancy gourmet salts so much better than that cheap tub of table salt at the corner store? It’s all about the processing–or, rather, the lack of processing. Table salt and sea salt are both fundamentally made from salt taken from seawater, but that’s where the similarity ends. Table salt is run through a rigorous gamut of machinery designed to extract everything that is not sodium chloride and leave a perfectly uniform pile of granules for public sale. Gourmet sea salts, on the other hand, are barely touched. The water is collected and evaporated off to leave a super-salty brine, and then the salt is allowed to dry before being packaged. That minimal level of processing leaves sea salts with a much higher mineral level as well as a wider variety of natural flavours and colours, since each type of salt directly reflects the environment it came from. No wonder it tastes better. So What Do You Do with Sea Salt? Since the flavors of sea salt are normally quite delicate, you don’t want to waste it by dissolving it in boiling water for pasta or adding a tablespoon to your bread dough. Using it directly in a recipe will just result in losing those special characteristics that caused you to buy the salt in the first place, so you might as well just use your cheap, boring table salt there. Save the fancy stuff for use as a finishing salt. Sprinkle it on top of the food after cooking or during the final step so that you and your guests can enjoy the full effect of the colours, textures, and flavours that are unique to sea salt. 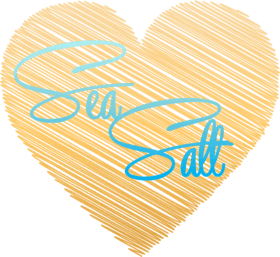 What Kinds of Sea Salts Are There? When you’re trying to decide what salt will best suit your favourite dish, it’s important to know what your options are. Texture is one of the most important things to consider. Most sea salts can be catagorised as either crystals or flakes. Within those subcategories, there is still some variation, though. For example, Fleur de sel is famous for having a rather delicate, moist crystal, while Hawaiian red and black salts have larger, crunchier crystals. Himalayan sea salt is also technically crystalline, although it comes in big chunks of rock salt and must be broken into appropriately-sized crystals. In terms of flakes, Halen Mon and Maldon both have a very crisp sort of flake, while Murray River salt flakes are more delicate and melting. Obviously, flavour is also important. All sea salts share the same salty top-note from the sodium chloride, but each has its own subtle additions ranging from the earth tones of Hawaiian red alaea sea salt to the briney freshness of Maldon salt. In addition to natural variation, many companies also provide varieties with added flavours, such as Halen Mon’s smoked sea salt or Hawaiian sea salt with bamboo. Since you eat with your eyes first, it is necessary to consider colour, too. Many elegant dishes pair well with the simplicity of white salts like Maldon or Halen Mon or the muted grey of Fleur de sel, but pink salts like Himalayan sea salt or Murray River sea salt can add a romantic touch as well. In some cases, black salts like Cyprus sea salt or Hawaiian black lava salt can add an unbeatable touch of drama. Cooking with sea salts is all about selecting the right one for the job. While you can feel free to use whatever you have on hand, you’ll get the best results when you use a complementary salt for your dish. When cooking vegetables, you’ll want to use a finishing salt that is fairly light in texture and fresh in taste in order to not overwhelm the vegetables. Maldon sea salt, for example, is quite subtle with a delicate crispness that works well when sprinkled over softer vegetables like sauteed courgette or steamed broccoli. Heartier veg like roasted potatoes may do better with something earthier, like Hawaiian red sea salt. Of course, if the vegetables are to be served raw in a green salad, feel free to go with a really crunchy salt like Himalayan sea salt for a nice textural contrast. In most vegetable dishes, the salt is at its best when simply sprinkled on top after cooking. Most seafood dishes are fairly light, so a delicate salt like Halen Mon will complement them without being overwhelming. If you’re doing something a little spicier like fish tacos, though, a smoked salt can be perfect. Sushi is another special case. Since it’s typically quite soft, a crunchy salt is ideal, and a black salt looks particularly stunning against the white rice. Try Hawaiian black lava salt for a great contrast. For meat, you’ll need something a little more robust in flavour. Murray River sea salt has a nice flavour from the red algae in its water, so it pairs well with many meats. For roasted meats especially, consider sprinkling the salt on top just before popping it into the oven. That way, the salt partially melts into the meat, forming a beautiful crust on top. More salt can be passed at the table to really show it off. You might not expect it, but baked goods and desserts are wonderful with a good sea salt. Chocolate with a sprinkling of Fleur de sel is a classic, as is the same salt on top of rich caramels. Typically crispier, flakier salt is better than crunchy crystals for use on candies. Sea salt is also nice when added to bread rolls before putting them in the oven. The best way to do this is to brush the uncooked dough with a beaten egg, then sprinkle it with a good crunchy sea salt like Cyprus or Himalayan sea salt before baking it. This gives a lovely gloss with a nice crunch and contrasting colour. In most cases, you’ll want to use a heavier hand with sea salt than you would with table salt, since sea salt contains less sodium chloride. Taste as you go, though, just to be sure! Really, when it comes to cooking with sea salts, the sky’s the limit. A little sprinkle will improve practically any dish.